Recap: The world takes Maddie Hyde by storm when, in 1945, her husband Ellis and his best friend, Hank, whisk her away to Scotland to search for the Loch Ness Monster. It sounds silly, but the search is very real for Hank and especially Ellis, whose father tried and failed to find it himself, thereby making a national fool of himself. Now Ellis is set on redeeming his father and proving his worth by finding the monster himself. But as the three leave their socialite home of Philadelphia for a shabby inn/restaurant in Scotland, they realize their lives can’t be any more different from those who live by the sea. Day in and day out, Hank and Ellis spend their time looking for the loch and getting good and drunk. This leaves Maddie to her own devices at the inn, where she eventually befriends the staff. The longer Ellis is gone, the drunker he gets, and the more abusive he acts toward Maddie — both emotionally and verbally. Maddie soon notices many of her prescription pills are missing, and she’s correct in assuming Ellis is taking them. The time spent in Scotland opens Maddie’s eyes to the man her husband truly is and makes her wonder where her life is going from here — her own internal war as WWII rages on in Europe and as her husband struggles to find the Loch Ness Monster and his own worthiness. Analysis: At the Water’s Edge is ripe with metaphors in a beautiful, if not mildly overstated, way. Initially, the search for the Loch Ness Monster comes across as silly — surprising at the very least, especially coming from bestselling Water for Elephants author Sara Gruen. But as the story continues, the existence of the loch becomes less important. It becomes clear that the monster is a metaphor for all of the other monsters in Maddie’s life — Hitler, her husband, her lack of family support. In the end, when she confronts all these monsters simultaneously, it happens — where else? — at the water’s edge. Yet another metaphor for her imminent rebirth and fresh start, of which she is entirely deserving. While the metaphors are well-devised, so is the structure of the novel, which starts off with a brief scene that takes place three years before the start of Maddie’s story. When those two story lines eventually converge, it’s done in a way that made me say “Ohhhhhhh” out loud. It takes some time, but it all starts to come together, and the book picks up momentum from there. It’s hard to tell where Gruen is going with the novel, but that uncertainty is refreshing, as is the ending of the novel. Maddie’s empowering development is similar to that which Gruen writes about in Water for Elephants, and this book is likely to have the same success. MVP: Maddie. She grew up feeling so undeserving of anything, but as it turns out, she is the most deserving of good things. It’s just a matter of pushing herself to realize that. When she does, she blossoms, and that self-discovery is exciting to experience. 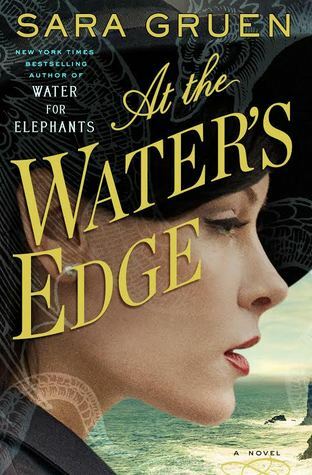 Get At the Water’s Edge in hardcover for $20.72. Or on your Kindle for $11.84.